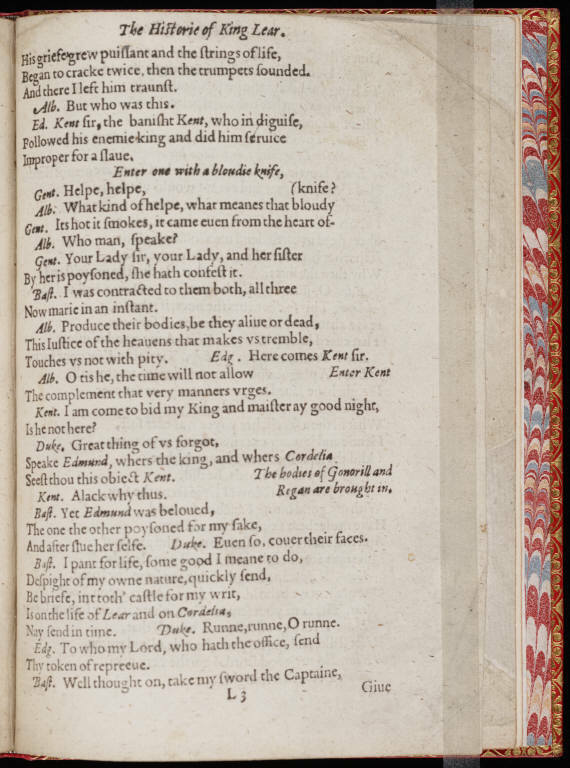 The Tragedy of King Lear first appeared in a quarto printed in 1608 by Nicholas Okes as Shakespeare’s True Chronicle History of the life and death of King Lear and his Three Daughters. 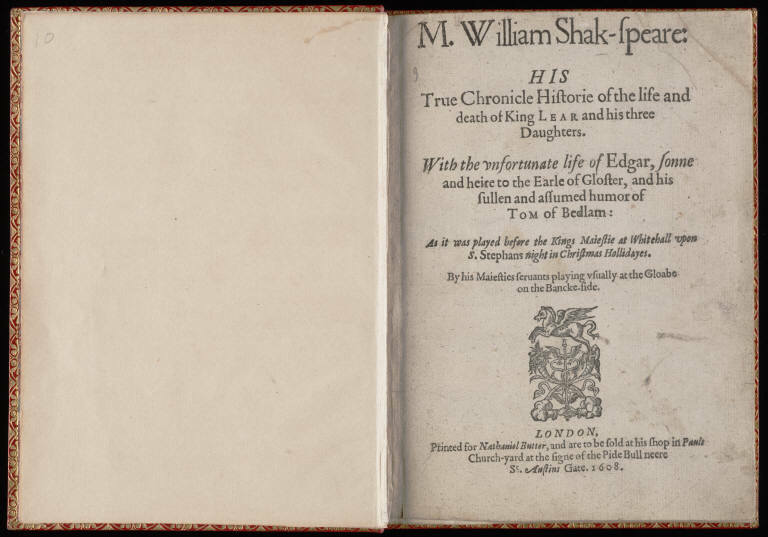 The shift in title is a slight one—what we think of as a tragedy today was first publicized as a history—but it is indicative of the many variations, discrepancies, and contradictions littering the history of King Lear’s printed versions. 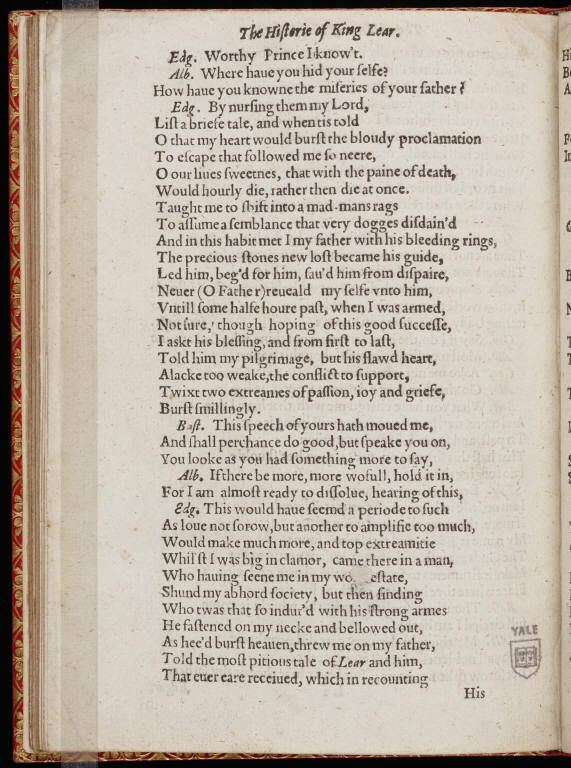 Two more editions would succeed Okes’ initial quarto, a second quarto printed in 1619, and the first folio version four years later. And there I left him traunst. Edgar’s lines offer a powerful, if powerfully melodramatic, rendition of his meeting at 4.5 with Lear and Gloucester–so why should they have been cut? One answer may be that the Edgar who utters such lines risks a poetic self-indulgence that threatens his moralizing tendencies, or makes his moralizing tendencies seem themselves to be a kind of self-indulgence. To cut such a speech, then, may have been to restrict Edgar’s character, to make him more stalwart, controlled, authoritative. If you were an editor putting together a modern version of King Lear, what would you do with these lines about Kent—would you keep them, bracket them, or remove them altogether? And what story of King Lear would you be producing along the way?